Cancer is an abnormal overgrowth of cells. Oftentimes, these cells form a solid mass called a tumor. A tumor can be classified as benign or malignant. A benign tumor is not very harmful because it stays in place. Also, it does not cause dysfunction in neighbouring tissues. What makes a malignant tumor so “bad” then, by comparison? Malignancy means the tumor spreads, taking up more than its fair share of resources and disrupting other organ systems. Adenocarcinoma – by far the most common type of gastric tumor. Adenocarcinomas originate from the innermost layer of the stomach (the mucosa). Gastrointestinal Stromal Tumor – develops in specialized cells (Interstitial cells of Cajal) in the wall of the stomach. These cells are responsible for coordinating the movement of foodstuffs down the GI tract. Gastrointestinal Carcinoid Tumor – originates in specialized cells (Enterochromaffin cells) in the wall of the stomach. These cells are responsible for releasing hormones and other chemicals that control digestion. The severity of gastric cancer is diagnosed based on the TNM staging system which assesses the location and spread of cancer cells beginning from a primary tumor site (American Cancer Society). How common is this disease? Gastric cancer is the 5th most common malignancy in the world (World Health Organization). In Canada, the disease is less common, but unfortunately it is still quite deadly. In 2017, approximately 3500 Canadians were diagnosed with gastric cancer (Canadian Cancer Society). Table 1 compares Canadian gastric cancer rates to those in some other relevant countries (World Health Organization). As shown by these numbers, gastric cancer is much more common in East Asian countries than it is in North America (Canadian Cancer Society, World Health Organization). Gastric cancer is more common in males than in females (National Cancer Institute). New cases of the disease have been declining over the past few decades in both males and females (Canadian Cancer Society, National Cancer Institute). This is partly because better sanitation and healthcare around the world has made infections with helicobacter pylori (H. pylori) bacteria less of a common problem (see below) (Atherton). It is most commonly diagnosed in older adults, aged 65-74. However, people of any age can get the disease (Canadian Cancer Society, National Cancer Institute). Frequent infections: H. pylori is a bacteria which lives in the stomach of many people (Atherton). Most of the time, it is harmless. But when overly active, this bacteria can cause peptic ulcer disease and has been associated with gastric cancer in many studies (Atherton). The CDH1 mutation: the CDH1 gene codes for a cell attachment protein. Mutations to this gene are passed along in a family and are associated with a higher risk of developing hereditary diffuse gastric cancer (National Cancer Institute). Sometimes, people with the CDH1 mutation will undergo a prophylactic gastrectomy (meaning their stomach is removed before they are diagnosed with gastric cancer) to avoid developing the disease. Lifestyle: unhealthy lifestyle choices and exposure to cancer-causing substances called carcinogens (such as smoking cigarettes) can increase the risk of disease (National Cancer Institute). There is no single treatment for gastric cancer. Treatment is specific to each patient. The first step in deciding on a treatment plan for gastric cancer is determining how advanced the disease is at the time of diagnosis. To begin to understand the treatment process, we can categorize the disease as either Early or Advanced Gastric Cancer. There is no standard definition for “early” gastric cancer. In general, early cancers are limited to the inner layers of the stomach. Cancer cell growth in lymph nodes, as well as the size of the tumor are other factors which have been considered in defining “early” stomach cancer (Sargoni, Waddell). We will consider all T1 and T2 tumors to be early gastric cancer. Surgery to completely cut out the cancerous area is the only curative treatment for gastric cancer. This only works in early stages of disease.There are various surgical procedures which may be used to treat the disease. The most common procedure is a gastrectomy with lymphadenectomy. Chemotherapy: chemotherapy should be given with surgery to help treat the disease. Experts still do not agree whether it is better to give chemotherapy before and/or after surgery. Chemoradiotherapy: chemoradiotherapy involves giving chemotherapy and radiation therapy. This approach has not yet been standardized into treatment procedures. Stage T3 or higher stomach tumors are considered Advanced stage gastric cancer (Sargoni, Waddell). This means that no surgical procedure can completely cure the disease. Unfortunately, most gastric cancer diagnoses in North America are made at this stage. The standard treatment for advanced gastric cancer patients is chemotherapy. This treatment is tailored to the characteristics of an individual’s disease. For example, patients with recurrent cancer may receive chemoradiotherapy (instead of just chemotherapy) if they can tolerate it. Different chemotherapy routines are prescribed based on whether or not the cancer cells express a protein called HER-2 (Waddell). This is a protein on the surface of cells called “human epithelial growth factor receptor”. High expression of this protein means there are too many active copies of the HER-2 gene. HER-2 overexpression is oncogenic, meaning that it causes cancer. So, this protein is associated with the cells of many different cancer types (including Gastric Cancer) in some individuals. Patients must fit a set of parameters called the “eligibility criteria” to consider participating in a Clinical Trial. In cancer trials, these criteria often describe a certain location and stage of the disease. If someone is eligible and agrees to join the trial, they are randomly assigned to a treatment group. This is very important, because it means that not everyone receives the same treatment. A lot of the time, patients (and potentially even their doctor) will not be told which treatment they are receiving. This is called “blinding” and it is done to minimize bias and make sure the results of the experiment are accurate. Successful Clinical Trials are a the best form of evidence to determine appropriate treatments. They are the Gold Standard in science! The results of a Clinical Trial can help researchers determine if a new treatment is better, worse or the same at achieving a particular goal compared to the control drug or placebo. Participating in Clinical Trials can potentially give patients access to treatment with new or otherwise unavailable medications or treatment routines. It is also an excellent way to contribute to research, so that the medical community can continue to develop better ways to help gastric cancer patients. DISCLAIMER: the following story is fictionalized and meant to explain the general process of enrolling in an oncology clinical trial; it in no way represents a specific patient experience. Carrie is an advanced gastric cancer patient who has has been diagnosed with a T3 tumor in the distal region of her stomach. She is not eligible for gastrectomy surgery. Carrie has been treated with chemotherapy for the past several months since her diagnosis. However, she does not seem to notice any relief of her symptoms and would like the chance at another treatment. Carrie’s son tells her that it might be possible to enrol in a Clinical Trial, which represents the final stage of quality-testing for a new medicine or treatment plan before it becomes prescribed by doctors. Carrie learns that the treatments being tested in a Clinical Trial have already passed through many stages of intense testing to make sure they are safe. She agrees with her son that this could be a good option for her. The purpose of a Clinical Trial is to find out if a new treatment is truly better than the standard options which are currently being used to treat patients. So, they often follow a randomized design. This means that patients are randomly assigned to one of the comparable treatment groups. Only one group will actually receive the new treatment, and usually patients are not told which medicine they are taking (which is known as “blinding”). After learning this information, Carrie is still interested in participating in a Clinical Trial even though she knows she is not guaranteed to receive the new chemotherapy. Carrie speaks with her doctor about Clinical Trials happening nearby. She learns that a hospital in her city is currently recruiting patients for a trial which compares the old chemotherapy Carrie is currently using, to a new routine. Thankfully, her characteristics (age, cancer diagnosis, previous treatment, etc.) fit the trial eligibility criteria. Carrie is able to get in contact with the local Trial Coordinator using a referral form from her doctor. This individual gives Carrie more information about the trial and guides her through the consent process. The Trial Coordinator sits down with Carrie and explains what the Trial is trying to accomplish, the commitment and timeline required from participants, as well as potential side effects of the treatment. Carrie correctly understands that she is not obligated to participate, and that she should only say “yes” after thinking about her choices. Also, Carrie knows that if she does decide to participate, she can withdraw consent (drop out of the trial) at any time. Feeling a little overwhelmed, Carrie takes the information she was given home to discuss with her family. She also goes to see her Family Doctor to ask for his advice and takes some time to think it over. Eventually, Carrie decides that she does want to participate in the Trial, and gives the Coordinator a call back. The process of “obtaining informed consent” in Clinical Trials is extremely important! This means: a) the patient fully understands the Trial and their role in it, b) the patient knows about the potential risks and benefits of participating, c) the patient understands that they can choose to stop participating at any time, and d) they give their signature as a participant. Informed consent begins with a conversation between the researcher and the patient. Carrie had talked to the Trial Coordinator and after taking some time to think about her options and get some advice, she decided to give consent! When she calls the Trial Coordinator and lets them know she has decided to participate, she schedules an appointment at her treatment centre for the baseline visit. When she goes and meets with the Trial Coordinator the next time, she signs the consent paperwork and allows researchers to collect some of her information. They record her height, weight and a blood sample. She also fills out a few surveys about her lifestyle, symptoms, gastric cancer diagnosis and past treatment. After deciding to give consent, Carrie is enrolled in the trial and begins treatment. She attends regular check-up visits at the hospital to allow the researchers to collect data. At these appointments, she typically provides a blood sample, has a CT scan and answers questions about her lifestyle and coping with her cancer. Because this is a Randomized Controlled Trial, Carrie will not find out which chemotherapy routine she is actually receiving. There is no guarantee that by joining the Trial she will receive better treatment than the medication she was taking before. Although the details of each Clinical Trial are different, Carrie’s story is representative of many cancer patients who may register for a Clinical Trial especially after given a diagnosis of advanced gastric cancer. What can I eat? How might this change around the time of my treatment? Because gastric cancer affects major parts of your digestive system, you should expect your diet to change after your diagnosis and treatment. The tumor could block off part of the GI tract and make eating difficult. Many gastric cancer patients experience a decreased appetite as a symptom of their disease. After surgery, what is left of the stomach is much smaller. This means it fills up with food faster, and patients will feel full even though they might not have actually eaten enough food to give their body energy and maintain weight. Dumping Syndrome is when food moves through the stomach and small intestine very quickly. In this case, nutrients are not absorbed and the patient can lose weight (Canadian Cancer Society). It is easy to become deficient in certain key vitamins such as B12, calcium, folate and iron. Your body needs these ingredients to keep up many of its regular functions, so it could be a good idea to take vitamin supplements (Canadian Cancer Society). After surgery, it is recommended that patients follow a soft-food diet. This resource from the UK has a helpful informatic for showing what you can eat at each phase after surgery (University of Southampton). How will my diagnosis change my daily activities? Will I be able to go to work/school while being treated? The answer to this question depends on each patient’s quality of life after treatment. Quality of Life is an important measure of a patient’s physical and psychosocial health. It describes their physical symptoms, as well as social and emotional factors. Unfortunately, there is no universal way to measure QOL, which makes it difficult to compare across studies. Recently, the results of one major trial called CRITICS were published (Cats),. This study compared overall survival in patients receiving chemotherapy versus chemoradiotherapy after gastric cancer surgery (Cats). They also looked QOL as a secondary measure of patient health. Patients filled out a questionnaire to assess their QOL at the beginning of the study, and again after the treatment6,14. They found that there was no significant difference between chemotherapy and chemoradiotherapy groups over time (Cats, Van Amelsfoort). Although this aspect of the study was inconclusive, it is important that the researchers collected this information. Tracking QOL over time can can help to determine the effectiveness of one treatment over another. This becomes especially important if two treatments are similar in terms of how they affect lifespan or the chance of cancer recurrence – in this case researchers should place more emphasis on comparing other factors like QOL! There has not been a lot of information collected about gastric cancer patient QOL in North America in comparison to Europe and East Asia (Kaptein). In Canada, we are getting better at understanding the changes in the QOL of stomach cancer patients. This data (see Table 2) shows patient-reported symptoms within one year of diagnosis of gastrointestinal cancer in Ontario, compared to the average of all cancer patients in the province (Bubis). The information displayed tells us the percentage of the patients surveyed who reported experiencing Moderate or Severe symptoms in each category. Symptom severity is assigned a number using a tool called the Edmonton Symptom Assessment System (ESAS). ESAS is a reliable way for researchers to understand how cancer patients feel by asking them to rank their symptoms on a scale of 0-10 (where a score of 0 means No Symptoms). Scores from 4-6 are considered Moderate, and scores from 7-10 are considered Severe (Bubis). Overall, gastrointestinal cancer patients seem to experience symptoms comparable to the average cancer patient. However, some symptoms (i.e. : nausea and lack of appetite) tend to be experienced more intensely in GI cancer patients (Bubis). This information is a good starting point to assess how stomach cancer might affect patients relative to other cancers. It is likely that most patients undergoing GC treatment will have to take some time off of work or school in order to receive their treatment. For early GC patients, this might mean taking a break around the time of surgery to allow for pre-surgical treatment, the operation and recovery time. For advanced GC patients who will be continuously treated with chemotherapy, attending medical appointments and coping with the physical symptoms of the treatment may make it challenging to return to normal activities. How can I connect with other GC patients? Gastric cancer is a difficult diagnosis to cope with. There are multiple resources available to support patients during this difficult time. These resources, as well as relevant information and testimonials are available for your perusal at MyGutFeeling.ca. Specifically, information regarding upcoming support group meetings can be found here. This is a great way to find and connect with other gastric cancer patients who may be facing similar challenges. Additionally, information about family support at Sunnybrook can be found here. Some other resources which may be helpful are nostomachforcancer.org and debbiesdream.org. Finally, support services in Canada can be found on the Canadian Cancer Society website. Ask your healthcare provider or community groups for other support resources in your area. What is the difference between adenoma and adenocarcinoma? Adenoma refers to a tumor that originates in the mucosal lining of the stomach. This is the name given to the tumor when it is benign (American Cancer Society, Ha). Adenocarcinoma refers to the tumor after it has become malignant (American Cancer Society, Ha). When patients begin the process of enrolling in a clinical trial, it is very important that they understand what the trial is trying to accomplish and what their role as a participant will entail. According to the Health Care Consent Act of 1996, healthcare providers (including doctors and researchers) need to make reasonable efforts to ensure that patients comprehend the treatment being offered (Government of Ontario). In Clinical Trials, this also means explaining possible adverse effects (side effects) of the treatment. Informed Consent needs to provide enough information for a “reasonable person” to be able to understand the treatment and make a decision (Government of Ontario). If the patient is incapable of making this choice, then a substitute decision-maker can become involved instead (Government of Ontario)! Informed Consent begins as a conversation between the researchers and the patient. In many cases, researchers who are recruiting participants for a Clinical Trial will reach out to doctors who can recommend eligible patients. If the patient is interested, the researchers will explain the Trial and answer any questions. Patients may take some time to think about participating and are usually free to contact the researchers if they do decide to participate. It is very important to note that this entire process is voluntary! There is no obligation for patients to participate in a Trial at any point (Government of Ontario). Finally, the patient should know that they can withdraw consent at any time in the Trial process7. This means that if they change their mind and decide to stop participating for any reason, they are allowed to do so! What do the terms “randomization” and “blinding” mean? Clinical Trials are a very strong form of evidence. They are the Gold Standard in scientific research! To make sure the results of a clinical trial are valid, the researchers must take precautions to reduce bias as much as possible. Biased research favours one particular result of a study over another one; so, a biased trial would not accurately discover the true pros and cons of a treatment. Randomization is the technique used in good Clinical Trials to assign patients to a treatment group; it makes sure that each participant has an equal chance of being in any given group. This way, differences between patients in each group are minimized. Often, randomization is done using technology such as a number generator. For example: if a Clinical Trial enrols 1000 patients to test the effects of Drug A vs. Placebo, every single patient will have a 50% chance of receiving Drug A, and a 50% chance of receiving the placebo. Their assignment will be random. Blinding means not knowing which treatment group a patient is in. In a single-blind study, patients are not told which treatment they are receiving; this can be done by making sure all of the possible drugs/placebos involved in the Trial look the same, for example. In a Double-Blind study, both the patient and their healthcare provider do not know which treatment the patient is receiving. Blinding is done to minimize bias and make sure the results of the Trial are valid by ensuring that differences between the patient groups are minimized throughout the length of the trial. Blinding can be challenging in Clinical Trials comparing surgical techniques – how can a patient not know what surgical procedure they are receiving? This is possible when two similar procedures are being compared. In this case, however, blinding the surgeon (double-blind) is not possible (Karanicolas)! American Cancer Society. About gastrointestinal carcinoid tumors. Available from: https://www.cancer.org/cancer/gastrointestinal-carcinoid-tumor/about.html. [Accessed June 7, 2018]. Bubis, L. et al. Symptom burden in the first year after cancer diagnosis: an analysis of patient-reported outcomes. Journal of Clinical Oncology. 2018. 36;11(1103-1112). Available from: doi: https://doi.org/10.1200/JCO.2017. 76.0876. Canadian Cancer Society. Nutrition and Stomach Cancer. Available from: http://www.cancer.ca/en/cancer-information/cancer-type/stomach/supportive-care/nutrition-and-stomach-cancer/?region=on. [Accessed June 8, 2018]. Government of Ontario. Health Care Consent Act, 1996. Available from: https://www.ontario.ca/laws/statute/96h02#BK0. [Accessed June 27, 2018]. 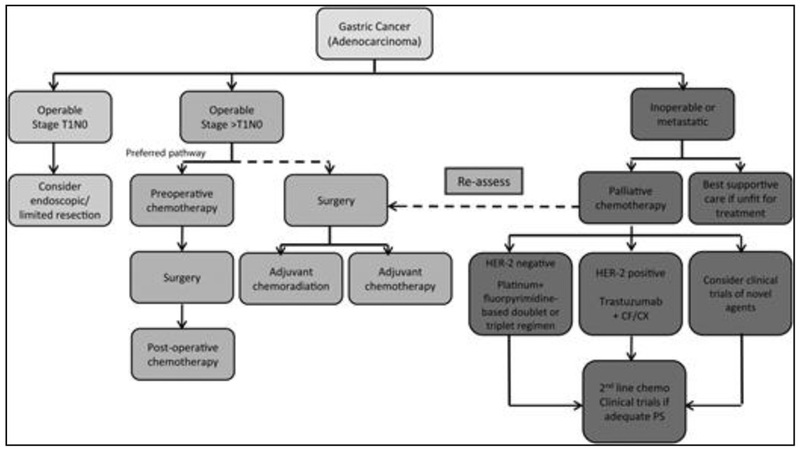 Ha, J. Gastrointestinal carcinoid tumors: a review. Journal of Gastrointestinal & Digestive System. (2012). 2:2. Available from: doi: 10.4172/2161-069X.1000107. Karanicolas, P.J. et al. Blinding: who, what, when, why, how? Canadian Journal of Surgery. 2010. 53:5. Available from: PMID: 20858381. MyGutFeeling. Events – My Gut Feeling. Available from: https://mygutfeeling.ca/stomach-cancer-support-group/ . [Accessed June 18, 2018]. University of Southampton. Following a soft food diet after a gastrectomy or oesophagectomy. Available from: http://www.uhs.nhs.uk/Media/Controlleddocuments/Patientinformation/Digestionandurinaryhealth/Following-a-soft-food-diet-after-a-gastrectomy-or-oesophagectomy-patient-information.pdf. [Accessed June 8, 2018]. Waddell, T. et al. Gastric cancer: EMSO-ESSO-ESTRO clinical practice guidelines for diagnosis, treatment and follow-up. Annals of Oncology. 2013. 24;6 (vi57-vi63). Available from: doi: https://doi.org/10.1093/annonc/mdt344. World Health Organization. Stomach Cancer (fact sheet). Available from: http://globocan.iarc.fr/Pages/fact_sheets_cancer.aspx. [Accessed June 7, 2018].